The heroin epidemic in Manchester claimed more lives in the month of February than ever recorded in the city before. "I feel like I am running out of people that this disease can take," said Manchester resident Justin Bachert. "We just went to a few wakes this month and it will be one month coming up this week." A record breaking 14 people in the city died from a heroin overdose last month alone. Bachert, a recovering addict, knew almost half of them. "It could have easily been me," he said. The former high school athlete and Eagle Scout became addicted to heroin half way into his first year of college. What happened next was a blur of blue lights, syringes, and jail cells. "I don't even know where the last five years went, I've spent every summer incarcerated," Bachert said. His story is one that Manchester Firefighter Chris Hickey hears all too often. Hickey says last February there were five overdose deaths. That number has nearly tripled. Hickey suspects a more deadly drug called Fentanyl is being mixed and marketed as heroin. "It's going to be 50 times as powerful and they're not going to know what hit them until it's too late," Hickey said. 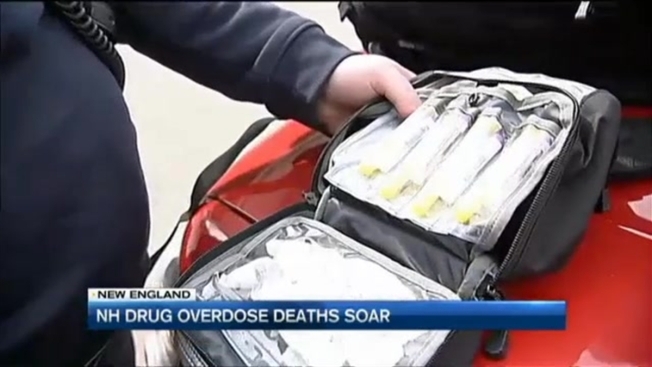 He showed us his bag of the life-saving overdose reversing drug Narcan. "There isn't a single guy out of ten stations and 240 firefighters that haven't administered Narcan," he said. The epidemic has become so bad, Hickey spends some of each work day cleaning up drug paraphernalia in city parks. "See here's a cap," he said while picking up a small orange object Tuesday. "I never thought in a million years this is what I'd be doing." Hickey cleaned up the park just in time for Lindsay Perkins to bring her daughter and niece to the swings. "It's scary to know my kid could come here, and know my kid could fall on the ground and be poked with a needle just by going to a park," Perkins said. "It's sad." As for Bachert, he's five months clean and trying to reach those still still battling addiction before he loses another friend. "More people will die next month, more than the 14 we have now, and you're number is going to get pulled sooner or later if you keep using this drug," he said. Bachert is decorating his new apartment, rebuilding a relationship with his five-year-old son, and working to get his license. He also plans to go back to college someday.